This post is brought to you by Chrissy at The Taylor House. Are you looking for lunch ideas that are unique and different to send with your kids every day in their lunch? Here at Southern Mom Cooks we are sharing a new bento lunch recipe every week to give you inspiration and ideas other than the normal peanut butter and jelly sandwich. If your kids are like mine, they need variety in their lunch. They don’t want to eat at school but they don’t want just a sandwich in their lunch bag either. By thinking outside the box a little bit, you can have your kids loving and eating everything you send with them. This week I put together a super easy breakfast leftovers lunch for you. Everyone loves breakfast and it seems like we always have a little bit left over at our house. We have breakfast for dinner often so why not have breakfast for lunch? 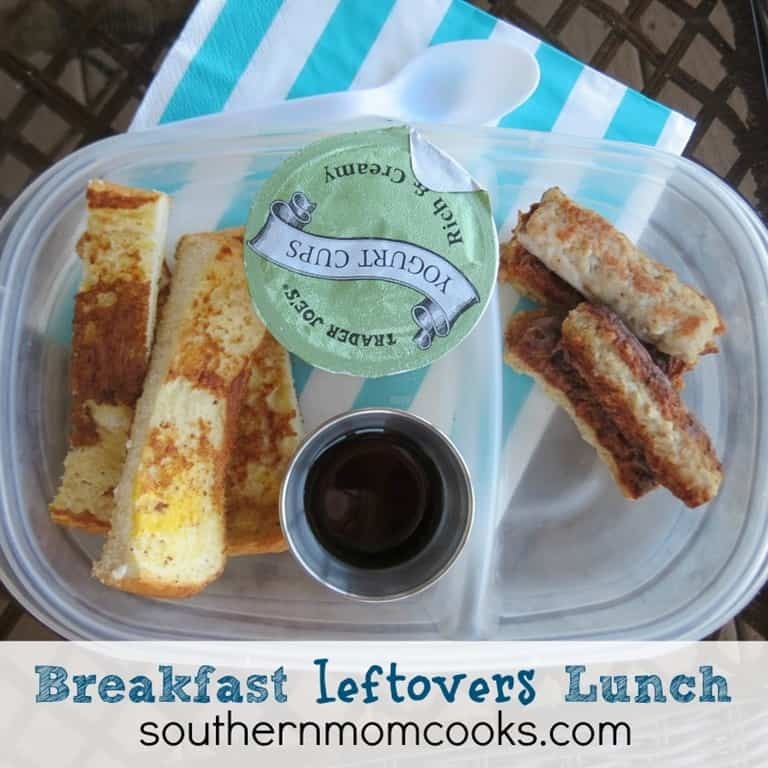 Making a breakfast leftovers lunch is as easy as packing up your leftovers from breakfast! Does it get any easier than that? I don’t think so! Find my step by step instructions below. Step Two – Cut up your French toast, waffles or pancakes into strips and add to the lunch. Step Three – Be sure to add syrup and some fruit or yogurt. Step Four – Enjoy your lunch! If you are making a delicious breakfast for your family just use the leftovers that you have. My boys loved this lunch because they love anything breakfast! It was so easy to make for them too. This lunch idea will be going on our Bento Lunch recipe rotation for sure. Here are a few other breakfast and bento lunch recipe ideas. Using your breakfast leftovers is a great way to make a new and delicious school lunch for your kids! I know they will love it! Chrissy Taylor is a wife, Mom, blogger and property manager. She and her husband of 15 years are raising two active boys in the Twin Cities area of Minnesota. Chrissy enjoys blogging about recipes, crafts, gifts and household tips.